Priyadarshani Sharma shared this story on her blog. My friends and I had a most inspiring day today! It all started with my ramblings on twitter when I came across a tweet on my timeline about Pratham Books and the book reading drive they want to conduct on 8th September 2012, World Literacy Day. There was no looking back after that. The team at Pratham Books was quick to respond to my query and helped me put together this beautiful experience. A special thanks to my husband Ankit, son Siddharth and friends Shilpa Neha & Anoop for lending their support. and arrange for a Marathi version of the book as the children are more comfortable with the language. We chose standards 1st and 2nd for the readings. ideas of where Susheela will draw her next Kolam. 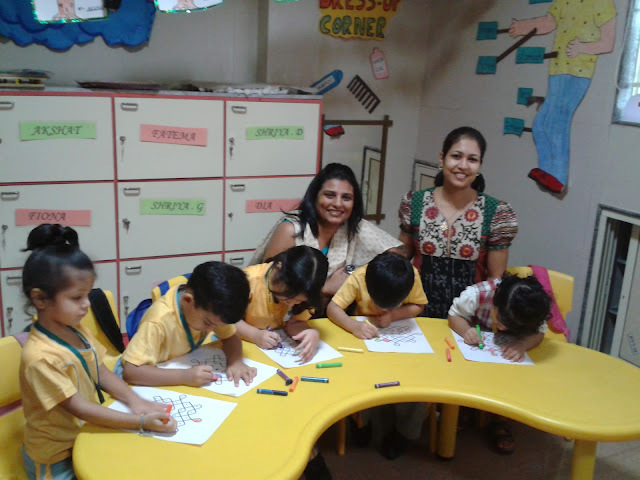 After the reading the children spent a wonderful time decorating their own Kolams with beautiful colours. Suddenly the group came alive with excited chatter of which colours to use and how to make the Kolams as beautiful as that of Susheela. 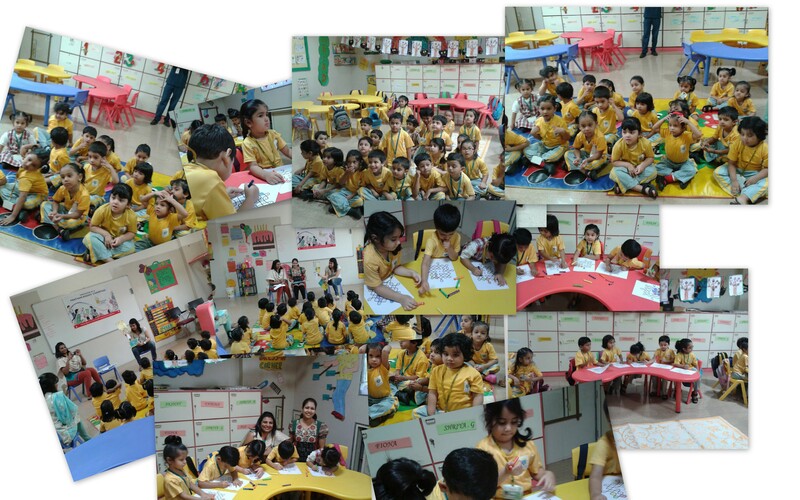 After the colouring, the kids proudly showed-off their creations! 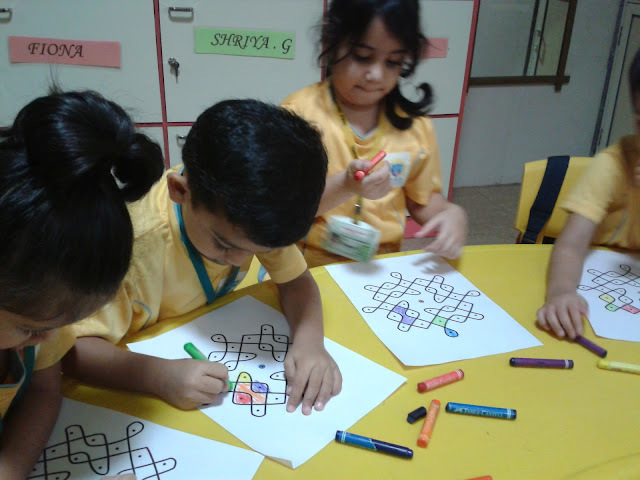 It was magical how brightly colored Kolams transformed a class into a kaleidoscope of infinite imagination! stories and include more classes (3rd and 4th) next time. 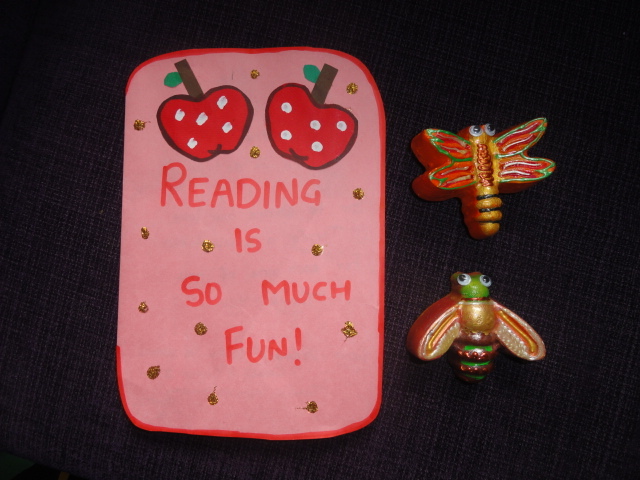 We are so inspired by this that we now plan to take this up as a regular activity and approach many more children and spread the joy of reading stories to as many children as possible. This has been a whirlwind 2 weeks for me and all started from the time I came in contact with Pratham Books and your drive for Susheela's Kolam. Since then I have done 4 more book readings at my son's school and have requests for atleast 2 more in different schools. All this is thanks to you all! 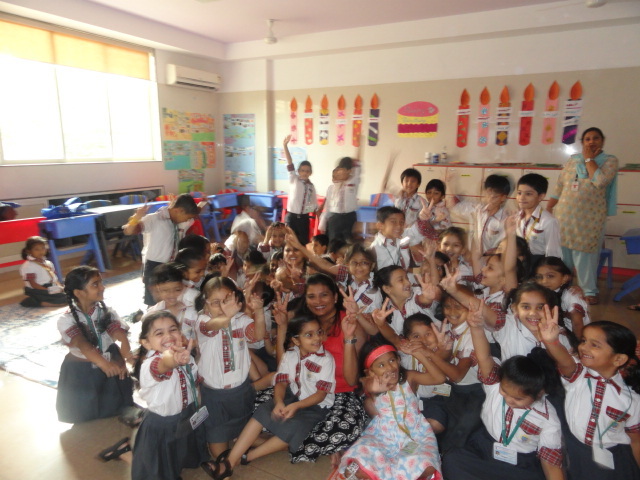 We had the awesome-est time with kids from The Thakur International School. The enthusiasm and exuberance of the kids was infectious and kept energizing us as we went from one class to another spreading joy and making new friends. Both Susheela and Ambili connected with our young audience immediately. While Susheela’s Kolam brought colourful delights, the story of Ambili and her encounter with Maakdi, the frog, got the children ticklish and giggling all over! The children’s imagination knew no bounds as they contributed enthusiastically in Shusheela’s quest for new canvases to draw her Kolams. Their mothers will have a hard time restraining their creative hands now for sure! After the story the children created their own beautiful Kolams with lovely colours. We introduced the kids to Ambili and saw the wonderous curiosity in their eyes as they waited to hear about her adventures. They giggled at her silliness and joked about how Maakadi the frog was fooling her. They jumped and hopped just like Ambili did with the frogs in the rain! 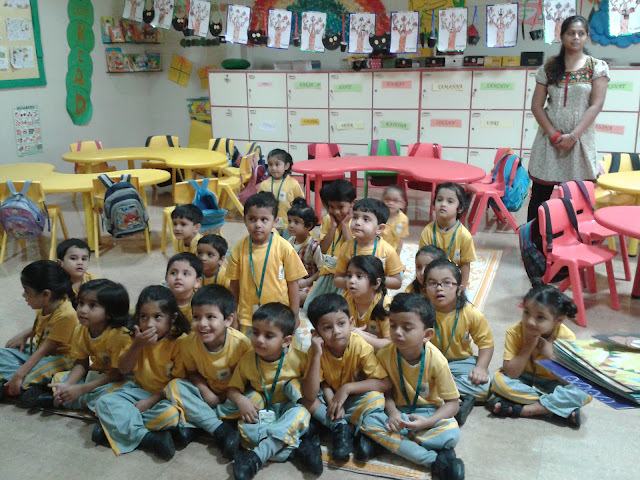 The kids shared their own experiences about how they dance and play in the rains and love to get all wet and muddy…what a splashy-splashy day we had! After we shared our experiences we all coloured our own Ambili in interesting patterns just like little Ambili from the story. The school gave us a sweet token. As we watched the kids enjoying the stories we were reminded of a simple fact…there is no age for innocence! 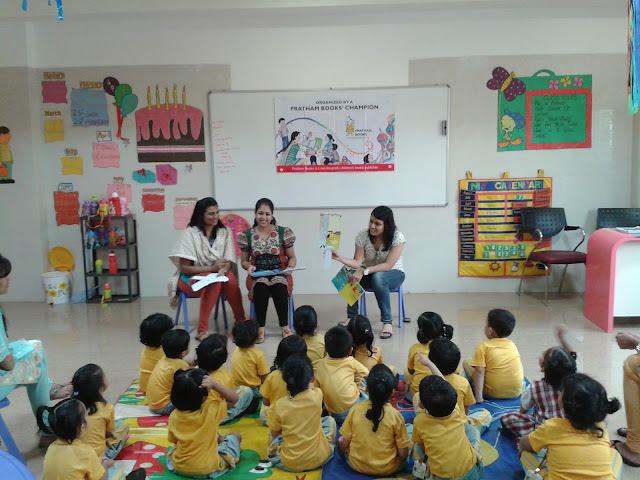 Thank you Priyadarshini for spreading the joy of reading!